I had a real problem of management of the darwins in my portofolio. I can NOT see the evolution of the darwins which will enter (or not) on my filter. 3- the darwins which have white $ logo" are NEW so i can invest. Please ! It's great for investors. 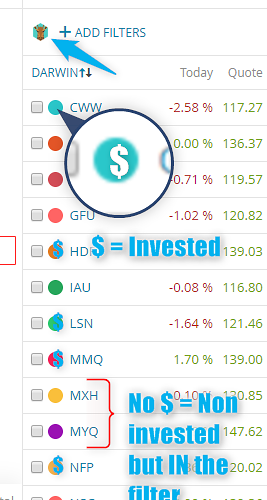 Maybe a dropdown next to the filters that lets you select if you want to see Invested/Non-invested/All DARWINs could be better? What's your opinion?